I'm excited to announce the launch of a new strategy V5. This is a major update touching almost every system in our infrastructure. Information on the website is updated as well as your dashboard. The is a step closer in my goal to provide a complete package of strategies. From slow risk managed first V4, mid-frequency V5, and eventually a profit first strategy - Binance Pump Monitor - that will monitor 100 alts in real-time. 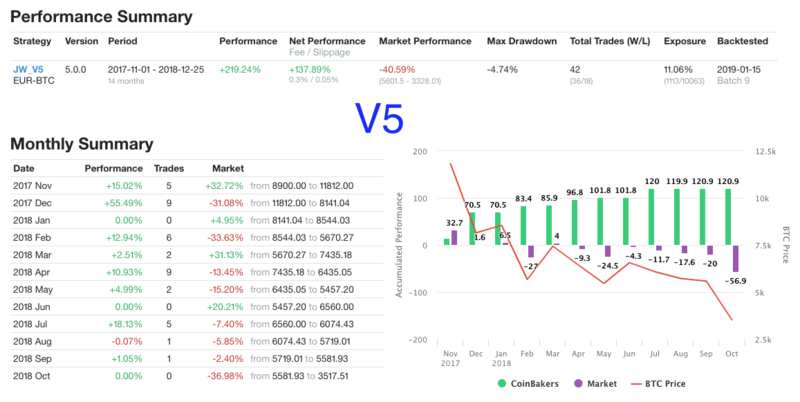 So V5 trades more often than the original V4 strategy. It generally trades in the same window as V4 but within this window it will enter and exits quicker. This makes it easier to mentally handle for the ones who check prices daily. Besides that, it has lower average per trade drawdowns, and able to secure profits from pumps if we are happen to be in one. Moreover the total amount of exposure is only a third of V4. Average trade frequency per month is 2.54 compared to 1.07 for V4. ￼ More backtests for USD and filter options will be added soon as at the moment the importing process is not finished yet for USD. It should give you an overall understanding of each strategies' characteristics. The net performance includes fees and slippage. The fees are CoinBases' 0.3% market order fees. I always try to fill your orders first using limit orders which does not incur any fees. So actual performance might be slightly better sometimes. I don't always beat the market, which is especially hard when splitting up backtests, but I also never said the strategies are ready and done ;) Always room for improvement. And in the long run we win. As you can see there can be quite some difference between gross and net performance. Especially for V5 which trades more often and therefor incurs more trading fees. Once Binance support is launched for V4 and V5, we can reduce our fees to 0.075% when holding BNB. I will run backtests too with Binance fees once it's available. Holding a stable coin does increase risk, so take this into account. Coming weeks I'll share more details, comparisons, interpretations and findings with you. As for pricing, it's going to be $49/mo for a hosted strategy. If you are not able to use CoinBase Pro or prefer doing it yourself, the price of the signals remain $39/mo. Hosted gives you reasonable crash protection, no more worries when to enter and exit, decrease your risk of exposure compared to hodling, and support future strategies, like the Pump Monitor. Besides that I want to give early supporters extra benefits when rolling out the anticipated Binance Pump monitor in Q1. Think like early access, priority, and discounts. The more consecutive months you have subscribed, the higher you will be on the list as an early supporter. V4 and V5 are our safest strategies to try to limit the risks that comes with trading and holding crypto. However there are many opportunities everyday with coins that can pump +20% while BTC stays flat in the meantime. The Binance Pump monitor will be my algorithmic take on trying to catch those pumps by monitoring 100 alts in realtime. A high risk / high reward strategy. With these 3 strategies I aim to offer a safe way (as far as safe goes with crypto) to grow our portfolio and one that can make a real difference. I'm very excited to pick up development again on the Pump Monitor but first we need a supporting strategy for V4 and V5 that can protect crashes that can happen on lower timeframes as outlined in my previous blog post. But one thing at a time, so for now check out the backtests and if you are confident sign up here. For existing customers that already had a trading server, if you login to the dashboard, you can provide billing information and resume automated trading right away. You can switch V4 or V5 on the fly and cancel anytime. For new customers signing up using your email and password, pick a strategy, provide your api keys and billing info. I recommend starting out with V5 and if you are confident and don't look at prices anymore, switch to V4. Start with a small amount to get the feel of the system, since this update, there is no minimum balance requirement anymore. For monthly subscriptions I use credit card (using Stripe payments, and not stored on our servers), if you'd like to pay with crypto, please pay 12 months in advance and I'll give you 2 months free. You can either pay in BTC, ETH or LTC. That's it for today, I'm done selling 😜 I hope you will like this update and always feel free to reach out to me for any questions or concerns.